I like this play, because it gives you a scoring opportunity in the post and if that is not there, one of your guards will have one side of the floor cleared out for the dribble drive. Players 4 & 5 should be your strongest post players. Players 2 & 3 should have the capability to dribble drive. 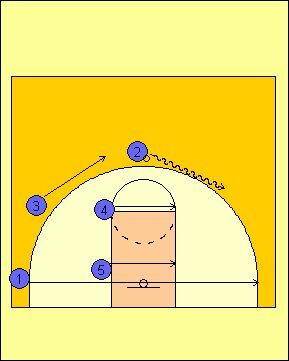 Players 2 & 3 cut diagonally to the wing from the block. You probably want to assign either Player 2 or Player 3 to cut first every time, so they do not run into each other. The following players will make their cuts simultaneously. Player 1 cuts to the corner on the ball side. Player 4 cuts diagonally across the lane to the elbow (high post) on the ball side. 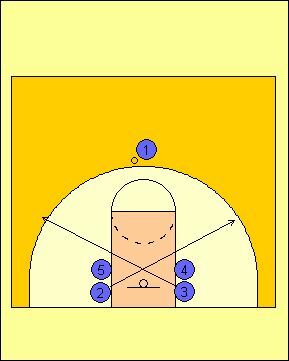 Player 2 cuts to the top of the key to clear out weakside help. Player 3 then looks to pass the ball to Player 5 in the post. If player 3 can not get the pass directly into Player 5, he/she can pass to Player 4 in the high post, which would create a better angle to pass the ball. It is important for Player 5 to keep the defensive player pinned on his outside hip, which will create a clear lane to the hoop. If nothing is there, Player 3 passes to Player 2. Player 2 will have the whole left side to drive or pull up for a shot. If Player 2 does not have a good scoring opportunity, he dribbles to the left wing. As player 2 dribbles to the wing, Player 1 cuts to the opposite corner. Player 4 & 5 cut across the lane. Player 3 comes to the top of the key. Now, you are in the same formation, but on the right side of the court. I really like this play against a zone defense. This is a nice and simple play. I implemted it along withhaving the 2 man call out shift if the play is run without a shot oppotunity evolving, and the cutters have to cross the lane and runn it from the other side. Nice for Man and zone movement. This offense is very simple but very good against zone in same time is good for youth team to learning kids specially centers how to move high-low. i don't know. it seems as if ur crowding everyone on one side of the court makin it easy for the defense to intercept passes and not have an outlet skip pass. but maybe it will work. ok one thing you have to understand is that if your team is quick and have been trained and coached to be play makers this overload with additional variations is no problem. the reason you would want different variations is to keep the defense guessing and involve all players to use their strongest moves in the areas you have seen them perform at. if you have a 2 that shoots and hits over 60% from a certain side, then design something to get that player involved and spark the score board. this is the same when you have miss matches on your big man down low; or you got a big man that has been trained to be quick and explsive with drop steps and the deadly hook; a playmaker on the move to the basket. look. my variation and anyone elses is not over loading to once side something designed without understanding the probabilities. one thing you look at is the press you go into once you shoot and make the shot. you train the players to make high percentage shots with the mind set that once we shoot we go into the press or base of our defense without turning your back on the offense. i run the 55 press like rutgers university. my offense is designed for each players strengths to be used together. and with the overload since i run a 55, i have three under the boards and two robbers in position. not getting ready, because they already are. 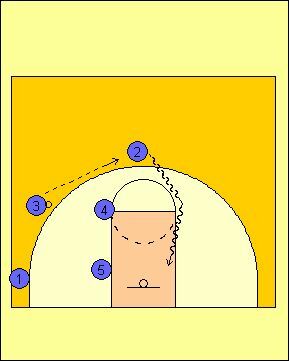 and yes this work against a zone, and the overload can be started from half court coming out of your press break. heyy this play is like totally awesome!!! Thanks for the information. 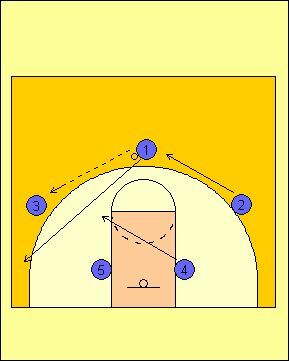 A variation could have the 5 back pick for 4 and then flash to the ball at the high post on the side 2 dribbled to. 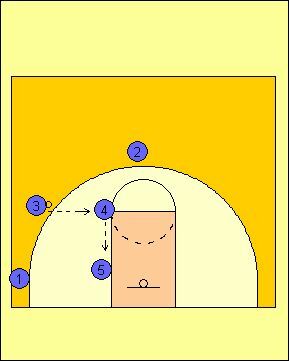 If they switch, 5 will be open at the high post. If they don't 4 should have a layup. You could also run this with 1 picking for two instead of going to the corner and then 2 who is at the top of the key reverses the ball to 1 on the opposite wing before 5 and 4 set back picks and then run it is as a continuous offense. Against a zone, I run this exact play except I run the 1 (PG) under the 5 (C) into the corner. The bottom guy in the zone always jumps to the corner thinking we are looking for a corner 3 and then we enter the ball to the 4 (PF) flashing to the elbow and we get hi-low action all the time. I have run this at both the freshman and varsity levels and had success at both levels. Would this work against a good sagging defense? I love this overload man to man play! I love how there are so many different options, and options for options. It's really organized, and really is a good post play! Not a fan. Very poor spacing. Remove the low post (5) player to weak side wing and let the high post (4) player screen for strong side wing (3) and corner (1). UConn runs this often with very good success. One problem with the overload offense is that you do not have a rebounder on the weakside block. A lot of missed shots will bounce that way. This is not a drill, it is a play!